A 19-year-old female, having aniridia with secondary glaucoma, presented with uncontrolled intraocular pressure (IOP) in the right eye (RE) on maximal topical and systemic medications. On examination, RE had a subluxated cataractous lens with advanced cupping. She underwent trabeculectomy with mitomycin C. On postoperative day 1, as the IOP was 32 mmHg, one releasable suture was removed followed by gentle bleb massage. On postoperative day 2, suprachoroidal hemorrhage was noted, for which the patient underwent two drainage procedures. Hemorrhagic choroidals resolved completely 4 weeks after drainage. Occurrence of suprachoroidal hemorrhage after removal of releasable sutures, although rare, is a vision threatening complication. This case highlights the occurrence of such a complication in a case of aniridia after releasable suture removal on the first post-trabeculectomy day, followed by gentle bleb massage. Aniridic and other developmental glaucomas, eyes with large eyeballs, appear to be predisposed to such perioperative complications, as in our case, and hence need caution intraoperatively, as well as in the early postoperative period. A 19-year-old female having aniridia with secondary glaucoma presented to our Glaucoma Clinic with high intraocular pressure (IOP) in the right eye (RE). There was past history of left eye (LE) uncomplicated trabeculectomy and cataract surgery in 2011. On examination, vision was OD 6/18; OS hand movement close to face with projection of rays (PR) was inaccurate in two quadrants. The IOP was OD 40 mmHg on four topical glaucoma medications, and OS was 14 mmHg. On slit lamp examination, OD, a superiorly subluxated cataractous lens was present with advanced cupping (vertical cup disc ratio of 0.9:1), and OS, there was aphakia with glaucomatous optic atrophy, and a functioning trabeculectomy bleb. Intravenous mannitol, oral acetazolamide tablets, and syrup glycerol were given according to weight, however, the IOP remained above 36 mmHg. After obtaining a written informed high-risk consent, RE trabeculectomy was performed under mannitol cover. A limbus-based conjunctival flap was raised, and a 4 × 4 mm superficial scleral flap was dissected. Mitomycin C (MMC) 0.02% was applied, 3 min subscleral and 1 min subconjunctival. A 3 × 1 mm corneoscleral osteum was made, followed by peripheral iridectomy. The scleral flap was closed with two corner 10-0 nylon sutures, and two releasable sutures were placed straddling the limbus. The conjunctiva was sutured with 8-0 Vicryl continuous sutures. The postoperative regimen included topical antibiotic–steroid drops/ointment and topical cycloplegic cycles for 1 h a day. On postoperative day 1, OD, the IOP was 32 mmHg with a vision of 6/60, PR accurate. Slit lamp examination showed a well formed anterior chamber and mild elevated, vascular bleb. Ultrasound B-scan was anechoic. One releasable suture was removed under topical anesthesia, and gentle bleb massage was performed after few hours to aid filtration. On postoperative day 2, vision dropped to perception of light (PL) positive, PR inaccurate in 1 quadrant, and the IOP was 44 mmHg, along with a shallow anterior chamber and anteriorly displaced lens. 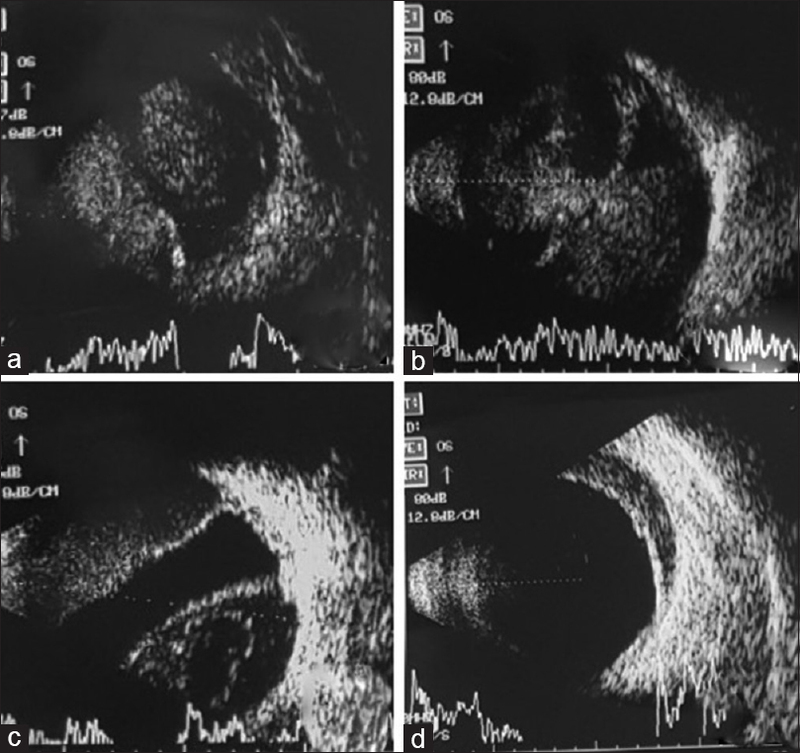 Ultrasound B-scan revealed kissing choroidals with massive suprachoroidal hemorrhage, (SCH) [Figure 1]a and [Figure 1]b. SCH drainage was done twice, i.e., on postoperative day 5 and 8. On the 5th day, minimal drainage was achieved. The second drainage on 8th day led to a significant drainage. Successive ultrasounds performed after the drainage procedure showed resolution of the choroidal mounds [Figure 1]c and [Figure 1]d.
Gradual resolution of a concurrent choroidal detachment was noted over 4 weeks. After 3 months, vision was 6/24 with an IOP of 12 mmHg, with functioning trabeculectomy bleb [Figure 2]a, [Figure 2]b and [Figure 3]. The incidence of SCH after trabeculectomy is 0.7–3%. Risk factors for SCH after trabeculectomy include high preoperative IOP, low postoperative IOP, myopia, and history of prior ocular surgery. The risk in aphakia is 13%, which increases to 33% after vitrectomy. Our case also had high IOP preoperatively (40 mmHg), and did not reduce even after intravenous mannitol therapy. Aniridia and a stretched thin-walled globe were possibly the risk factors in our patient. Valsalva while being extubated, vomiting, and coughing have also been known causes. Certain manoeuvres help to decrease the risk of SCH such as paracentesis before making an ostium, releasable sutures, prescribing eye patching in early postoperative period. SCH has been described following removal of releasable suture 15 days after combined phacoemulsification–trabeculectomy. In our case, immediate bleb massage was an additional risk factor that probably contributed to sudden fluctuation in IOP and SCH. Indications for drainage of SCH are kissing choroidals, corneal edema with lenticulocorneal touch, concomitant retinal detachment, and unrelenting pain. Because our case had persistent kissing choroidals on ultrasound, drainage was done on the 5th and 8th day after trabeculectomy. Releasable sutures in high-risk eyes should not be removed too early. Bleb massage immediately after the removal of releasable sutures may lead to a shallow anterior chamber and intraocular hemorrhage in a predisposed eye. Drainage of a suprachoroidal hemorrhage after a week may be more successful than earlier. Jampel HD, Musch DC, Gillespie BW, Lichter PR, Wright MM, Guire KE, Collaborative Initial Glaucoma Treatment StudyGroup. Perioperative complications of trabeculectomy in the collaborative initial glaucoma treatment study (CIGTS). Am J Ophthalmol 2005;140:16-22. Ruderman JM, Harbin TS Jr, Campbell DG. Postoperative suprachoroidal haemorrhage following filteration procedures. Arch Ophthalmol 1986;104:201-5. Givens K, Shields MB. Suprachoroidal hemorrhage after glaucoma filtering surgery. Am J Ophthalmol 1987;103:689-94. Gressel MG, Parrish RK 2nd, Heuer DK. Delayed nonexpulsive suprachoroidal hemorrhage. Arch Ophthalmol 1984;102:1757-60. Sathyan P, Singh G, Eong KG, Raman GV, Sathyan P, Prashanth S. Suprachoroidal hemorrhage following removal of releasable suture after combined phacoemulsification-trabeculectomy. J Cataract Refract Surg 2007;33:1104-5.